UK-based bus and rail operator National Express has agreed to buy Spanish transport firm Alsa for £262m ($462m). Alsa is the largest private coach and bus operator in Spain, operating a fleet of approximately 1,400 vehicles. National Express operates bus and rail services in the UK and overseas, and says it carries one billion passengers in the world every year. Chief executive Phil White said the firm was making a "significant step forward" by expanding into Spain. National Express had announced last week that it was in takeover talks with Alsa, which is owned by the Cosman family. In addition to Spanish bus services, Alsa also operates bus services in Portugal and Morocco, and runs long distance coach services across western Europe. The deal does not include Alsa's coach and bus operations on China and South America, which will remain under the control of the Cosman family. National Express said the takeover was subject to approval by the Spanish competition authority, and should be completed within about six weeks. "Both the National Express Group and Alsa have great experience in the express coaches and urban bus markets," Mr White said. 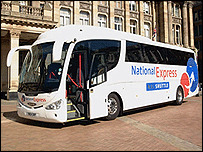 As well as running bus and coach operations in the UK and US, National Express owns, or has stakes in, a number of UK rail franchises. In a trading update, National Express said that trading at its UK and North American bus and coach operations was on target. However, it noted that rail travel suffered over the summer following the July bombings in London, particularly on those franchises that travelled into the city.